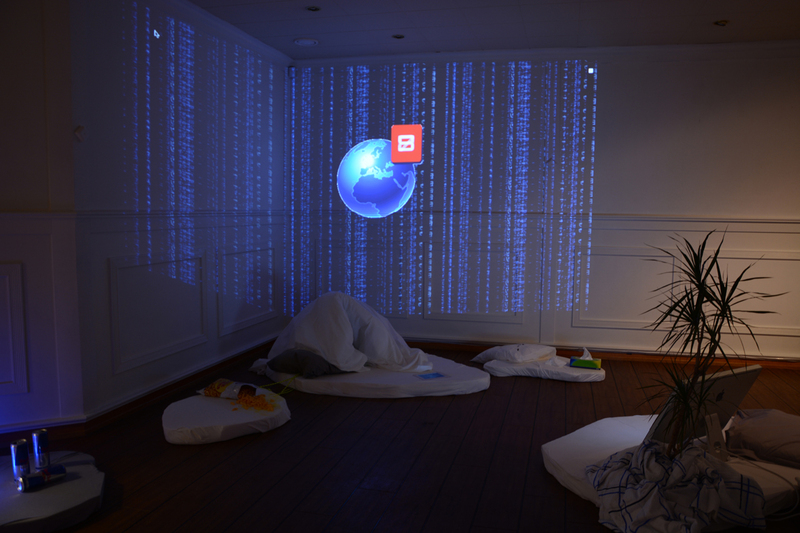 Becoming the Galápagos is an installation realized in 2013, joining the post-internet sphere of influence. 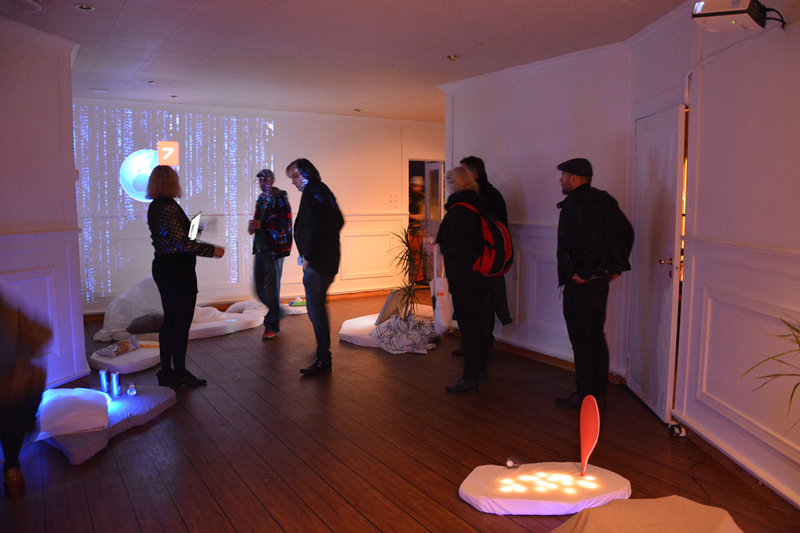 The work was exposed for the first time to the Gallery NEBBELUX in Fredrikstad in Norway (from October 26th till November 3rd, 2013). 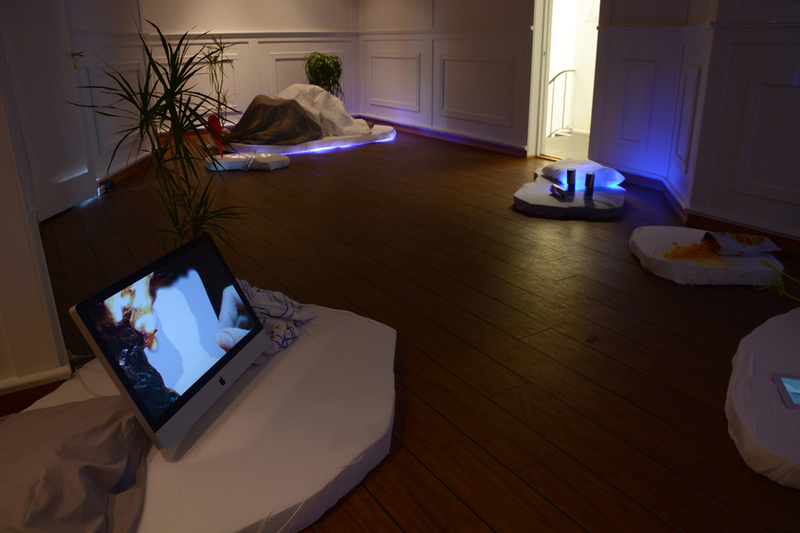 It consists of several elements of beddings arranged on the ground, representing islands (Galápagos islands), and heterogeneous objects as disemboweled bags of chips, blue neon, house plants, bottles of empty Red bull … Several computers and tablets are present, connected to Tumblr of the artist and spread the video of a photo of profile Facebook which burns. On one of the walls of the space of exhibition is thrown a livened up one animated .gif representing the icon of the notifications Facebook. Kaja ‘Cxzy’ Andersen also printed the homepage of its profile Facebook on a braid of bed. This original object is a part of the installation. Kaja Cxzy Andersen was born in 1985 in Stavanger, Norway. Andersen graduated with a BA in contemporary art from Tromsø Art Academy in 2011, and is currently doing her MFA at School of Visual Art in New York.